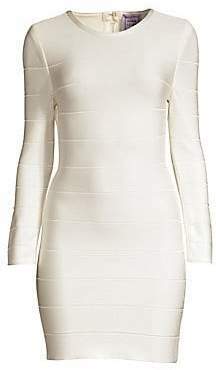 The classic bandage dress gets a refresher in a tan-and-white jacquard that draws the grain of wood to mind. 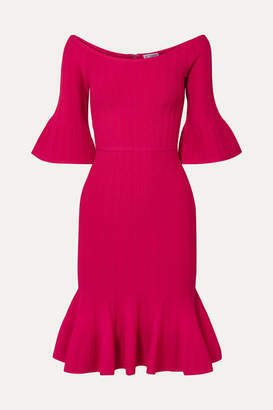 The stretch fabric partnered with a fit-and-flare silhouette serve to flatter the female figure. Scoopneck Sleeveless Back zip closure Scoopback Ruffle hems Lined Rayon/nylon/spandex Dry clean Imported SIZE& FIT About 54.5" from shoulder to hem Model shown is 5'10" (177cm) wearing US sizeSmall. Designer Evenin - Herve Leger. Herve Leger. Color: Gold Multi. Size: Medium.